On Tuesday, the Technique hosted a public debate in the Clough Undergraduate Learning Commons that probed the platforms and backgrounds of the four presidential tickets running to the be the next president and vice president of the undergraduate Student Government Association (USGA). Contrasting with last year’s USGA elections, where current USGA President Evan Gillon and Executive Vice President Ayo Aladesanmi ran unopposed, this year saw a wider array of candidates running for the presidential ticket, including a meme-driven campaign from presidential candidate Jimmy Forsmo and running mate Shishir Bandi, who have sought to bring attention to issues within Tech culture by promising to “veto everything” that comes out of the Undergraduate House of Representatives (UHR). Forsmo and Bandi, running as outsiders, acknowledged during the debate that they had never served time in any branch of SGA. “My aim in running for this position was to facilitate real change, and I believe that when there is an institutional and cultural problem at a community that cannot seek to be improved despite a unanimous call from the community to fix it, the only real vehicle in the community to fix it is a disruption of the status quo,” Forsmo said during the debate. 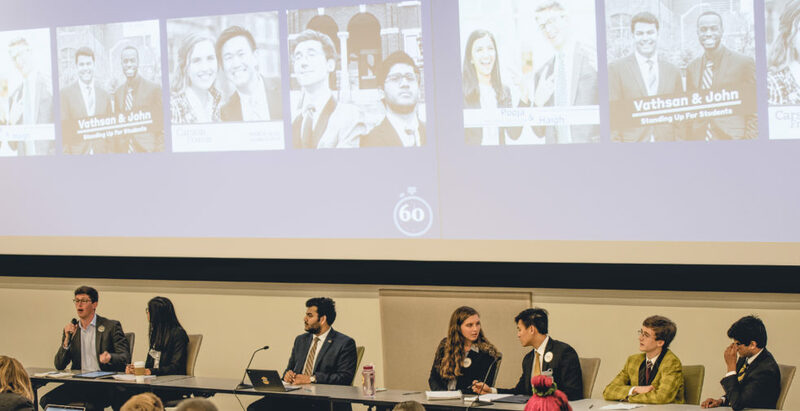 However, unless a major upset is to occur at the polls, the war for the executive leadership of USGA appears to be between the campaign of Pooja Juvekar and running mate Haigh Angell versus that of Carson Silbert and running mate Francis Yang. All four have held positions in the current USGA session’s executive cabinet: Juvekar as the VP of Internal Affairs, Angell as the VP of Academic Affairs, Silbert as the Chief of Staff and Yang as the VP of Communications. Vathsan Ramprakash, Joint VP of Finance and John Butler III, ran another SGA-member-laden campaign, but found their campaign sink after a Slack message surfaced on Reddit in which Ramprakash said he selected Butler, who is black, as his running mate because “increasing voter turnout among black students is better for strategy.” Ramprakash, who also had been criticized for shouting a profanity at an opposing candidate whose mother has cancer, conceded the race on Wednesday. Votes already cast toward the Ramprakash/Butler ticket will be included in vote totals that affect whether the election will pass into a runoff. The debate offered an opportunity for the candidates to showcase what made their platforms compelling and special. Each presidential ticket was tasked with answering both general questions on how they would approach their early days in the office or address different campus groups, as well as tailored questions to clarify points of their campaigns. When asked what would be their priority during their first 100 days in office, Juvekar and Angell cited reaching out to the new Tech president, administration and student groups. Silbert said that communication to campus leaders and would also be the focus during her first 100 days, but that she and Yang would also immediately act to address mental health. Silbert and Yang have proposed a “Hi, my name is campaign” that they would launch to address campus loneliness, in which students would wear name tags throughout the day to facilitate making new friends. Students can vote for presidential and UHR candidates at elections.gatech.edu until elections close on March 29. Results will be revealed at 5 p.m. on March 31.